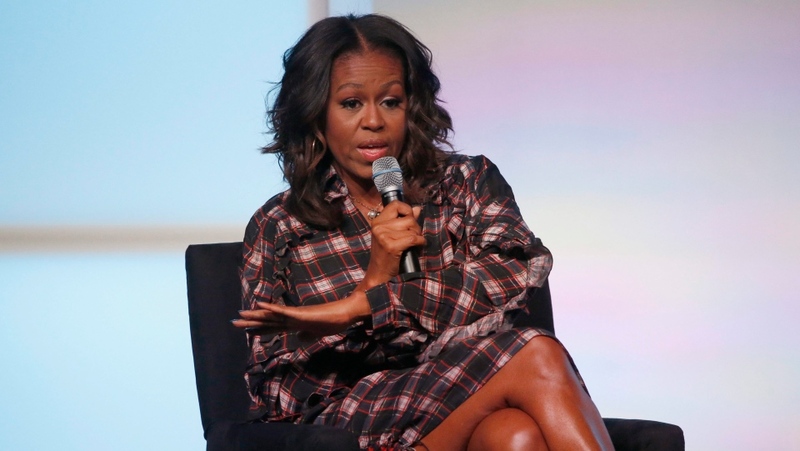 MONTREAL -- Former first lady Michelle Obama delighted and captivated her Montreal audience on Monday night, highlighting education and gender equality in an hour-long chat. Months after her husband delivered a speech to a sold-out crowd, it was her turn to take the stage. Obama took part in an hour-long question-and-answer session in front of a sold-out crowd of more than 10,000 people at the city's convention centre. Obama highlighted the importance of education for youth to reach their full potential, regardless of the colour of their skin. But, she added, adults had a role to play by setting examples and providing confidence -- in particular for little girls who see few women in positions of power. "I say that to all the fathers, brothers and husbands in this room," Obama said. "If you are not making space for women in your offices, just think about what that's doing to the girls that you think you love. "Those messages, that are subliminal, that we as women get every single day," she added. She participated in a discussion with Sevrine Labelle, the president of an organization that supports female entrepreneurs. Obama emphasized the importance of appointing women to leadership positions and higher political positions. "Don't get me wrong, men, we all need to be at the table," Obama said. "Right now, women are so absent at so many tables. People of colour with different experiences are so absent." The event was organized by the Chamber of Commerce of Metropolitan Montreal, which also organized last year's event featuring former U.S. president Barack Obama -- who drew 7,900 people to his talk in June. Attendees paid between $60 and more than $520 to see the former first lady. Organizers also provided 2,000 complimentary tickets so some Montreal youth could attend. Several dignitaries were at Monday night's event, including Quebec Premier Philippe Couillard, Montreal Mayor Valerie Plante and Sophie Gregoire-Trudeau, the wife of Prime Minister Justin Trudeau. Knowing her audience included many powerful decision makers, Obama made sure to address them. "There are men in this audience who are in charge of these decisions, in their companies, their organizations, today," she said. "So the power exists right in this room to make change tomorrow." Since leaving the White House, Michelle Obama has worked with her husband at their Chicago-based foundation, which aims to help citizens make a commitment to improve their society. Obama said she's also writing her memoirs, with details to be revealed later this month. But many in her Montreal audience seemed genuinely disappointed by her reaffirmation that she would not be running for president. Many have encouraged her to run since Obama delivered a fiery speech at the 2016 Democratic convention, but she said social change is her true calling. "I am not running for anything," she said. "My passion is not politics."